Never underestimate the power of a good hot dog. And yes… that is what we are talking about today. Hot dogs. Since I’ve become a grown up (the age at which this happened is quite debatable), I’ve held a firm stance on hot dogs. I absofreakinglutely love them, but in severe moderation. We are talking, like, three or four perfect hot dogs per summer, spread out so I have time to really crave them. Maybe one per month? I also don’t tend to enjoy things masquerading as hot dogs, such as sausages and stuff. If I want a hot dog… I want a hot dog. And that’s just how it’s been. After I made about sixty new years resolutions (not really), my cousin and I finished off some after holiday shopping back in early January. It was that day when she introduced me to a loaded hot dog from Five Guys, complete with sautéed mushrooms, grilled onions, bacon, cheese, ketchup, mustard and relish. Yes. I put things on my hot dog that I never thought I’d consume. Ever. It was hands down the best hot dog I have ever had, even being all trashed up. However, I was under the impression that while my trashed up hot dog was fabulous, I’d still enjoy a good, old-fashioned plain hot dog with mustard only and a side of chips. The trashed up hot dog would probably be a one time thing… even a once per year thing. I had one more crazy hot dog from Five Guys back in March before deciding that I HAD to make my own. I forced myself to practice patience because I knew I wanted to share said trashy hot dogs with my invisible internet friends, but when it’s snowing in April, it’s not exactly prime hot dog grilling weather. So I suffered and took one for the team. Meaning I tested hot dogs with various toppings for a few weeks straight until I deemed it warm enough on the East coast to share these things. Originally I had planned on tossing these your way a bit closer to the Memorial Day, but with Mother’s Day coming this weekend I’ve determined that it’s high time for hot dog cookout weather. High maintenance hot dog cookout weather, that is. Plus, like two weeks ago I was running errands and my day called me to say that he was grilling hot dogs, and did I want one? Um, of course I wanted one. I took a major detour just to go have a hot dog. So it’s time. I promise that the high maintenance dog is worth it. It’s covered in white cheddar cheese, juicy garlic mushrooms, honey caramelized onions, crispy fried bacon and your fair share of condiments. Trust me… if you don’t typically enjoy condiments on a hot dog, you probably will now. Things are different when your hot dog is covered in a two inch pile of deliciousness. I understand that you may be freaking out over the amount of work that is now going into a simple party staple, but here’s the deal. 1. It’s totally worth it, for sure. 2. This can turn into even more fun – like a big bad hot dog bar. Not just ketchup anymore! Now you can make the mushrooms and onions ahead of time and set everything up beforehand, warming the ingredients if desired before people go crazy. and 3. you could actually assemble your hot dogs ahead of time, throwing on topping after topping then wrapping them in tightly in foil – almost like a cheesesteak (autocorrected to “cheesecake.” obviously.). To serve, throw them on the grill or in a warm over for a few minutes. It’s as simple as that and yeah… the only way I’ll eat a hot dog now. And I gotta admit, I’m a little partial to my own version over Five Guys. But I’m kind of a brat so that’s to be expected. Heat two skillets over low heat. Add one tablespoons each of olive oil and butter to both skillets. To one skillet, add diced onions with a pinch of salt. Stir to coat. Cover and cook over low heat for about 15 minutes, stirring occasionally to ensure the onions don’t burn. Remove lid and add honey, tossing to coat and cook for another 10-15 minutes, until completely caramelized. Once caramely, set aside. In the meantime, add the chopped mushrooms to the skillet, tossing to coat. Cover and cook for 15-20 minutes, stirring once or twice. Add in garlic and cook for 5 minutes more. Remove from heat and season with a pinch of salt and pepper. Set aside. Cook hot dogs as desired: either grilled or in a skillet over medium heat until browned. Place each hot dog in a bun and top with an equal amount of grated cheese. Place hot dogs under the broiler (or even back on the grill) for a minute or two just until the cheese is melted. 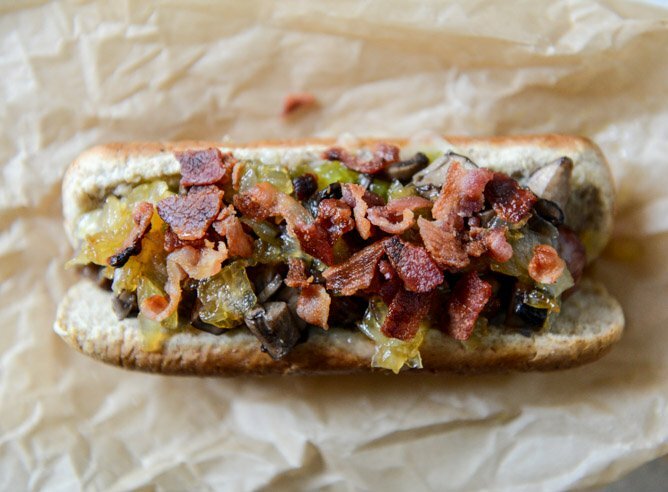 Top with ketchup, mustard and relish, then add mushrooms, onions and bacon. If not serving immediately, wrap in aluminum foil tightly. They can be reheated this way too! This makes me want to have a hot dog eating contest. Pistachio Pesto Chicken with Whole Wheat Spaghetti. I love hotdogs so much its almost embarrassing. Cheese goes so well with hot dogs, but this topping sounds amazing with lots of different yummy flavors going on! Mmmm! I have never done a hot dog like this! But then again in Australia we don’t do hot dogs well. This is bookmarked! These hot dogs scream summer and fun and deliciousness all over. Oh and don’t forget a messy face as I bite my way through. Love it! We had a hot dog bar party last summer during an outdoor movie night- lots of fun! There is an ice cream place in our town called Wannawaf (hot Belgian waffle sundaes- yum!) and they branched out into hot dogs a few years back. The grilled dun is always amazing, but the toppings totally make the dog! My favorites are A Dog Named Jeff with caramelized onions, cheddar, stone ground mustard and mayo and The Bark and Bite- caramelized onions, cream cheese and red pepper jelly… trashed up hot dogs are the best! please tell me that you have had a station street dog. the kimchi and banh mi dogs are crazy good! Making this right now and have everything prepped….can’t wait! I am hungry. I would love to try this recipe. My son will surely love it.